To post wild blueberry equipment that you are looking for or have for sale on our Wild Blueberry Exchange page, please send information to Mary Michaud, mary.j.michaud@maine.edu, with a description of the item, a contact name, telephone number and/or email address, along with your asking price. Also, please let us know when you have sold your equipment so we can remove your ad from our website. 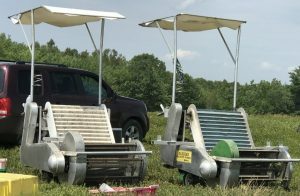 IMPORTANT NOTICE: There are many scams being perpetrated today and it would be prudent for each grower posting blueberry equipment for sale or wanted on our website to know who he is selling his equipment to and make sure checks received are legitimate before releasing any equipment. No product endorsement is implied, nor is discrimination intended against similar products. Cooperative Extension makes no warranty or guarantee of any kind concerning these products. Excellent condition used sparely for several years. 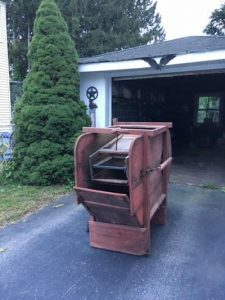 For Sale: DH Equipment has designed several machine models before arriving at a machine configured and optimized for wild blueberry picking. 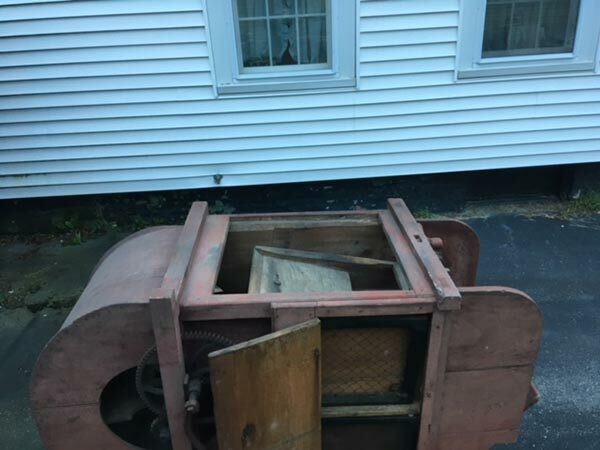 For Sale: Walk behind harvester and tractor mounted harvester. 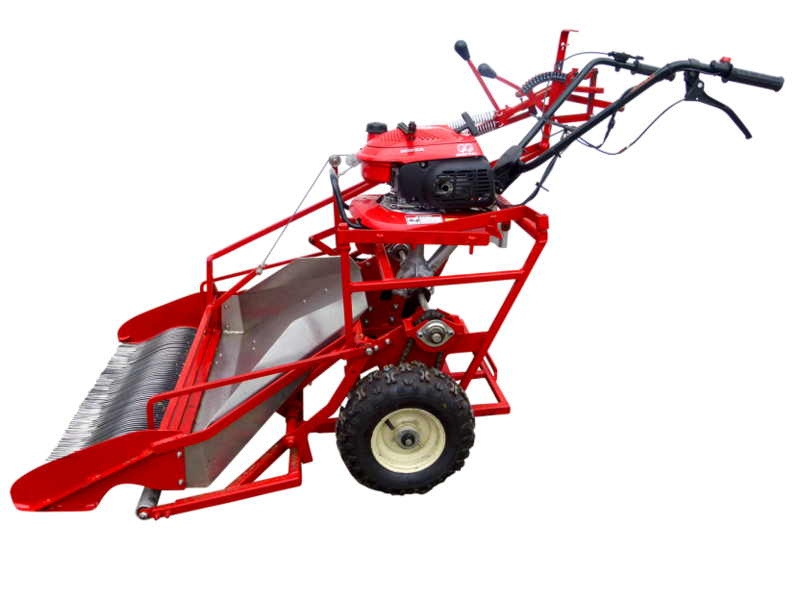 Contact: Acadian Machine Works Ltd.
For Sale: Picking head mounted on a Grasshopper mower. Wanted: The Skowhegan Farmers’ Market is looking for a few new vendors for the 2019 summer season. The market is on Saturdays from 9:00 a.m.-1:00 p.m. We are specifically interested in the following: Berries, Poultry/Eggs, Value Added Goods (all kinds! ), Dairy (cow), bottled milk, yogurt, etc. For more information and if you are interested in applying please visit our website. For Sale: Foggy Hill Farm is now a BioBest dealer! We will be coordinating the delivery of bumble bees for the blueberry folks in Maine. This is a similar product to the Koppert bumble bee quads we have purchased up to now but at a reduced price. We are coordinating a shipment to our farm here in Frankfort for the spring bloom this year. Price: Quads will be $250 with delivery to Frankfort included. For Sale: I have a hand crank field winnower for sale. 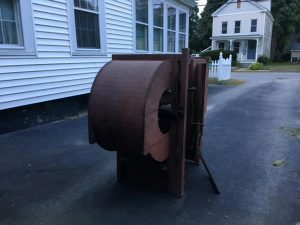 It works and is in fair to good condition. It has four different size screens. Make an offer. I need it out of my garage. 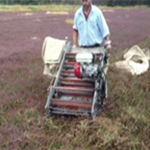 Wanted: We are looking for wild blueberries walk behind harvester or small harvester which is used with a small tractor. Something like in the picture on right. It could be new or used, if you have something to offer, please, contact us. 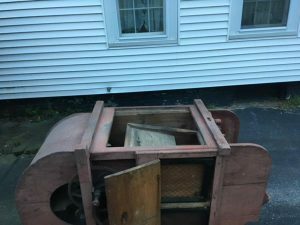 For Sale: Two mechanical pickers, good working condition, recently serviced and used this past season. For Sale: 100+ acres overlooking Pleasant River and the ocean, ~25 acres of improved blueberry fields. Over $100,000 worth of irrigation installed, including a nearly new John Deere pump, used less than 50 hours. Sod present is ideal for landscaping as well. For Sale: Irrigation equipment, all in excellent condition. A comprehensive list can be reviewed here. The three pumps listed are no longer available. The three sprinkler heads are still in the box, and priced at $1500.00 each. All used guns are $1000.00 each, and aluminum pipes/fittings are roughly half the price of new. 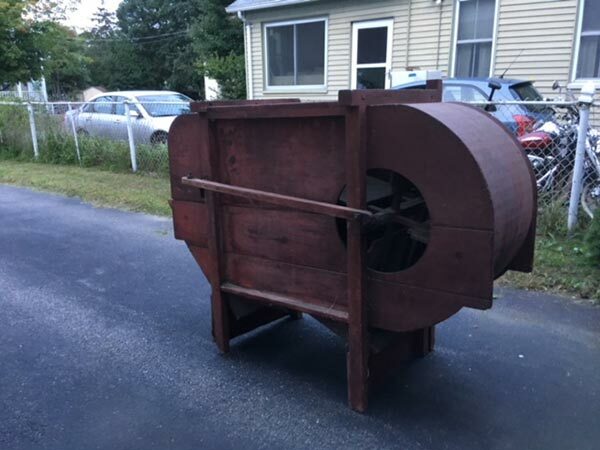 For Sale: Blueberry Harvester, Asking $32,000. 2000 John Deere 5410, open station, 4800 hours, 81 hp, 65 hp pto, 9 speed (3+3), Rops, Sun Canopy, loaded tires, 2 sets rear hydraulic connections, only used to harvest berries. Good condition with a DBE single 3-foot head harvester and conveyors, back rack with pallet forks, custom box rack, and box chute. Located in Cherryfield, Maine. 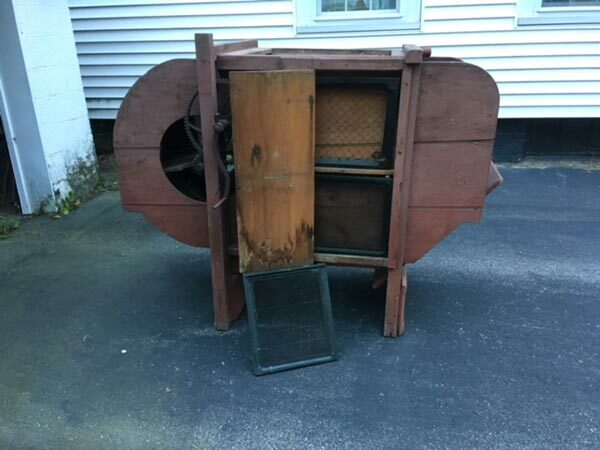 Willing to sell DBE harvester components separately for $17,000. Wanted: ~10 acres of blueberry fields in Waldo/Knox county. Wanted: A larger size fresh pack line produced by Maine Blueberry Equipment Company. For Sale: Well maintained blueberry Vicon fertilizer spreader and Kubota forks and bin clamp. 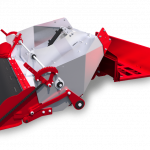 ’12 VICON PS403 Fertilizer Spreader CA$3,000 – Capacity of 400L per spec sheet. Wanted: Blueberry pack line that could be used or modified to pack cherry tomatoes. For Sale: MC 7918 JATA 0400 Mist Blower. Used approximately 30 hours, stored inside, ready for use, 110 gallon tank. 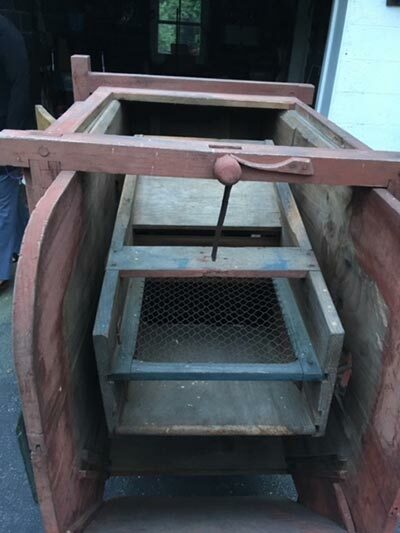 Sorting table with variable speed belt, 10′ x 2′. Asking $5,000.00. 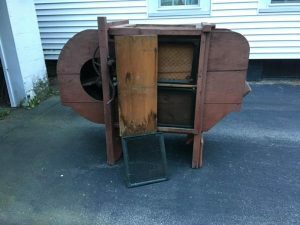 String sorter 2.5′ x 2″, variable speed drive with box of new strings included. Asking $2500.00. 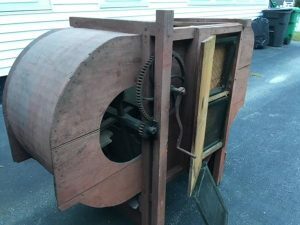 Blueberry juice press, horizontal squeeze box style with 9 pockets per side, great for pressing specialty juices, approximately 100 gallons/per hour depending on the fruit. Asking $7,500.00. For Sale: MBE Blueberry Oil Burner – 3 tubes, all rebuilt, new flotation tires, tubes, heads, hoses, belts. This oil burner has been stored inside, is in excellent condition, and ready to go. Asking $7,500.00. 3-point hitch boom sprayer 125 gallon capacity (complete). Asking $1200. Spare roller pump (rebuildable). Asking $20. 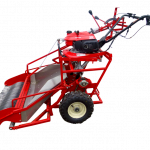 ATV boom sprayer (near new). Asking $275. ATV/tractor foam marker (new). Asking $350. Maine Blueberry Equipment Company walk behind harvester. Asking $7,000. Solo pesticide mist blower. Asking $150. Digital weight scale. Asking $95. Rakes and pails. Asking $200. Package for all items: Asking $8500. 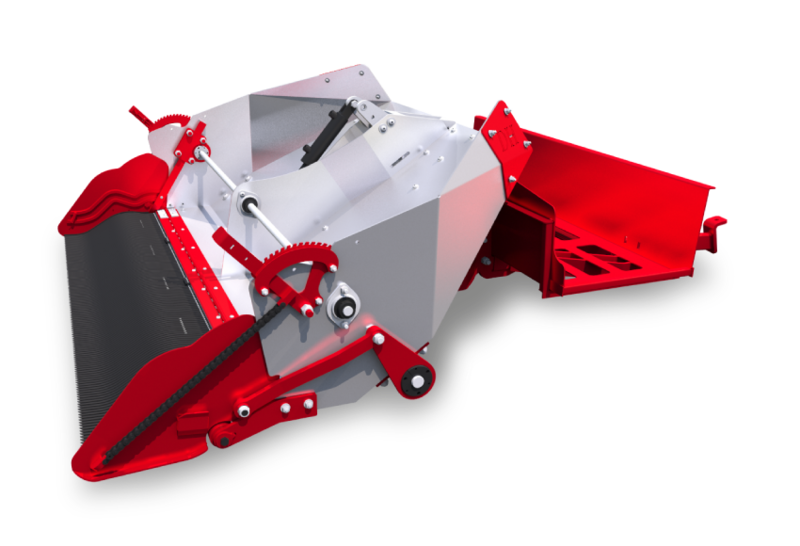 Two completely refurbished DBE single 3-foot head harvester systems: One harvester mounted on a TN75 4WD tractor and the other harvester to be mounted on tractor of choice. 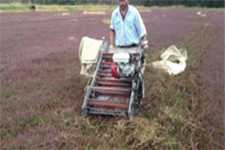 I also build and design custom hydraulic control systems for any wild blueberry harvester. For Sale: (2) 3,000 gallon fuel tanks (for gas, oil and diesel only). For Sale: Organically certified wild Maine blueberry leaves. And much more! Visit the website below for photos, details and prices. Visit the Wild Blueberry Exchange page for more information. If you are a Maine wild blueberry grower and would like to be added to our fresh-pack and value-added products list, please complete our Request Form. Complete Our Form to be Added to the Value-Added Products page.